Khalid Faraj Shipping CSR Report October 2018 – Employee who served 26 years with Khalid Faraj Shipping receives support from the Board of Directors. He was severely affected due to the recent flood in his home country in August 2018. Mr. Clent Mark Malarejes is nominated as Best Performing employee of the First Quarter 2018 and awarded for his excellent contributions”. Mr. Clent Mark Malarejes is nominated as Best Performing employee of the First Quarter 2018 and awarded for his excellent contributions. Khalid Faraj Shipping (KFS) participated in ADIPEC 2017, a prestigious Oil& Gas company exhibitions in the MENA region same like in previous years, starting from 13 till 16th November 2017. KFS had two stalls one in 5170 and second in 14420 and our latest Landing Craft Horeyeh 2017 build also participated in this event. Many prominent visitors from all major reputed Oil & Gas companies visited our stalls and vessel, as per the visitor log total 271 visitors visited to the vessel alone. Following vessels scored high during the year 2016, the selection was based on the QHSE performance criteria based on their track record, monthly KPI reports, Operational excellence and adherence with the maintenance requirements of the ship. 1. AHT Kessab 1 is winner with highest points. 2. LCT JARYEH scored second highest place. 3. TUG SAEED is the second runner up in the raw. 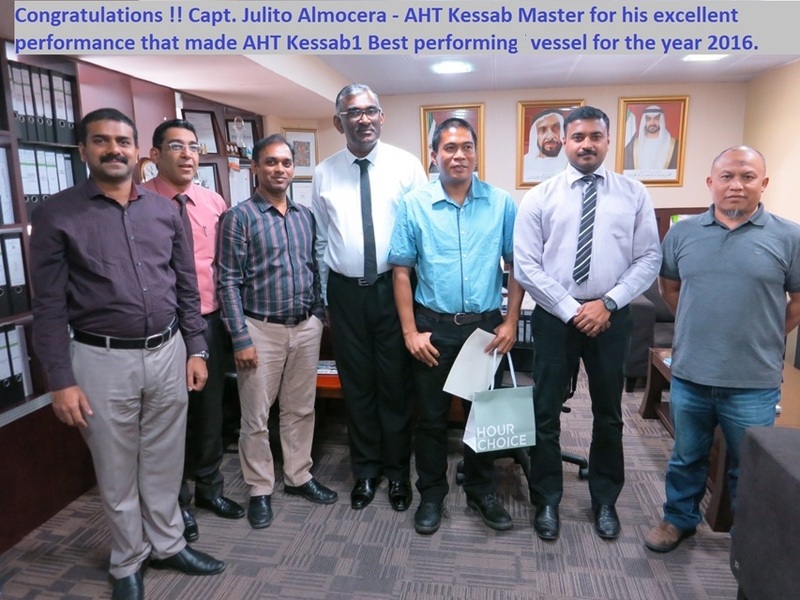 All crew in these vessels will be rewarded with an appreciation certificate and a gift. Khalid Faraj Shipping Management sincerely thanks to all good performers for their outstanding performance and contribution towards overall improvement of the company. This is a part of the motivation for promoting good employees and to become an employer of choice in the shipping industry. A medical campaign was organized for our employees which included free medical check-up along with a campaign on healthy living habits and awareness on metabolic syndromes like high cholesterol, high blood pressure, high blood sugar etc. which are the results of unhealthy life style. We always believe that human resource is our primary asset and consider it as our responsibility to promote good health among our employees through such activities. Offshore Pipe Laying Support, Offshore Dredging Support, Offshore Rig Measurement and the complete Offshore Supply / Sea Freighting associated jobs. Besides we operate Tugs and Cargo Barges carrying Bulk Cargoes like Gabbro, Aggregates, Road base, Dune Sand, Debris, Minerals, heavy Project parcels and industrial raw materials. Abu Dhabi, UAE – 10 November 2015 – His Highness Sheikh Hamed Bin Zayed Al Nahyan, Chief of the Abu Dhabi Crown Prince’s Court and member of the Abu Dhabi Executive Council, formally inaugurated the largest ver Abu Dhabi International Petroleum Exhibition and Conference (ADIPEC), marking the start of four days of industry-related discussions and activities, and bringing together leading international and regional decision makers to set the agenda for meeting the growing global demand for energy.